The ruling monarchs of Spain had established a permanent base n in the "New World" at Santo Domingo, on the island of Hispaniola, in 1496. Spain's Queen Isabella died at 53 after 30 years reign in 1504, and Columbus died at 54 in 1506 after a prolonged illness. Regarding newly discovered peoples across the sea, Columbus had believed that he might come across creatures that were half-human and half-monster, in keeping with the view in Europe that such people existed in remote places outside of Christendom. Europe didn't have universities yet that advanced biology with a clear-cut differentiation between the human species and non-humans, but a popular travel book by Sir John Mandeville, written in the fourteenth century, had reported the existence of half-monsters – a book written in several languages and published in numerous editions. Columbus had found no monsters, but suspicion remained among the Spaniards that half-beasts existed nearby, especially cannibals, and people who ate insects – believed to be the doings of the devil. There were Spaniards outraged at what those around them were doing – a kind of non-conformity that was ancient and would continue into the twentieth century. There was Bartolomé de las Casas (1484-1566) who traveled to the New World and whose writings would be source for historians. He was in conflict another writer from Spain who would be a source for historians, including Joyce Appleby. This was Gonzalo Fernández de Oviedo (1478-1557). He defended Spain in the New World and viewed natives with derogation until late in his life. One of the outraged on Hispaniola was a Dominican friar, Antonio de Montesinos. During an impassioned sermon in December 1511 he said,"Tell me by what right of justice do you hold these Indians in such a cruel and horrible servitude? On what authority have you waged such detestable wars against these people who dealt quietly and peacefully on their own lands?" The sermon angered his fellow Spaniards, including Admiral Diego Columbus, son of Christopher Columbus, the island's governor. Friar Montesinos returned to Spain and persuaded King Ferdinand to summon a group of theologians and learned men to suggest a remedy for what was called the "Indian problem." From these discussions, the Spanish kingdom of Castile produced on 27 December 1512 the Laws of Burgos. Maltreatment of indigenous people was forbidden and their conversion to Catholicism endorsed. 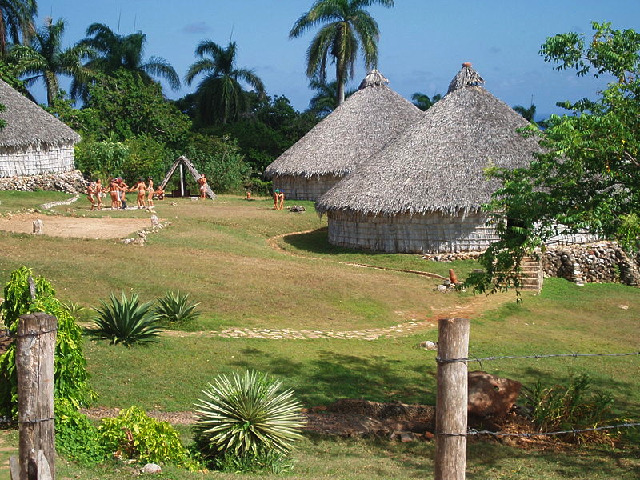 The monarchy's subjects were instructed to congregate the Taino of Hispaniola into villages near where the Europeans had received grants of land. The Spaniards were to build churches and to support and maintain priests, who were to give Indians instruction in the rudiments of Catholicism. The Indians were to be forbidden from engaging in commerce. They were to be allowed only one wife, and they were to work in the fields and mines, but not overworked, and they were to be fed and not beaten. The laws legalized the landed estate in the New World called the encomienda. It was a grant to Spaniards that forcibly grouped between 40 and 150 Taino under the authority of the holder of the grant. The law held that the Spaniard was to care for the Taino in "a reasonably protective and humanitarian spirit." Taino women more than four months pregnant were to be exempted from work. Vasco Núñez de Balboa was the son of a Spanish nobleman and on the island of Hispaniola after 1505, where he was a planter and pig farmer. In 1509, wishing to escape his creditors in Santo Domingo, Balboa set sail as a stowaway, hiding inside a barrel together with his dog. He had a charismatic personality and by 1510 was a leaders in establishing a settlement in what today is Panama, after driving the native people there into the jungle. In 1513 he led a force westward and was to become the first European to have seen or reached the Pacific Ocean. With Cuba conquered, Spaniards swarmed there from Hispaniola. Velazquez became the Spanish monarchy's governor on the island. The Laws of Burgos were extended there. A number of new settlements were created, including Santiago de Cuba in 1514 and Havana in 1515. One of the magistrates on the island was the ambitious Hernán Cortés, ten years younger than Velázquez and destined for conflict with the governor, although Velázquez had appointed him to his position of magistrate. Cortés had arrived at Santo Domingo, the capital of Hispaniola back in 1504 at the age of eighteen. In Cuba, a decade later, Cortés was in possession of an encomienda that provided him Taino labor for his mines and cattle, and he led a group that was demanding that they be allowed more Taino labor. From there for Cortés it would be off to Mexico, what would be called New Spain.